We are best quality Telescopic Alidade with more accuracy as per their requirements and to the full satisfaction of them in very reasonable prices. We, Quality Engineering Corporation, engaged in manufacturing, supplying and exporting a significant range of Antique Brass Items. In this range, we offer Greek Spartan Helmet, Roman Centurion Helmet, Diver's Helmet, Diver's Helmet Antique Finish and Diving Helmets. 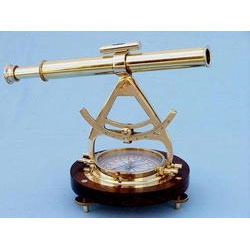 Along with this, we offer Armillary Sphere Globe, Ships Helmet Compass Brass, Brass Taper Telescope With Decorated Box, Brass Ship Bell and many more. These offered range is manufactured by making use of high-grade required basic material, procured from the accredited vendors of the industry. Furthermore, these offered products are longer service and fine-finish. Keeping in mind divergent demands of the clients, we have made the offered products available in different sizes and designs. With the support of our team and sound infrastructure setup, we have been able to provide our clients with the best-in-class products. Furthermore, to meet high expectations of the clients, we ethically execute entire dealing process with the clients. Distinguished position which we hold in this industry, is attained owing to our client-centric approaches.